This extension comes with MediaWiki 1.31 and above. Thus you do not have to download it again. However, you still need to follow the other instructions provided. tab key produces tab indents (since 1.22), soft indents before. Currently the extension is under development, and details of activation and functionality are subject to change. While this extension is licensed GNU General Public License v2.0 or later (GPL-2.0+) it makes use of the Ace editor software which is licensed BSD 3-clause "New" or "Revised" License (BSD-3-Clause). The WikiEditor extension needs to be installed for this extension to work. Installing the Scribunto extension is optional. Download and place the file(s) in a directory called CodeEditor in your extensions/ folder. This configuration parameter is provided by the Scribunto extension and must therefore be added after invoking the CodeEditor as well as the Scribunto extension which also needs to be installed for this to work. This configuration parameter is provided by the Scribunto extension and must therefore be added after invoking the CodeEditor as well as the Scribunto extension. Both the Scribunto and SyntaxHighlight extension also need to be installed for this to work. 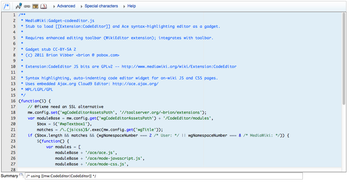 It is possible to change the configuration of the ACE editor, by hooking into the MediaWiki JS hook codeEditor.configure. The argument passed to your hook will be an ACE editor session. accessibility: tab/shift-tab are overridden. is there a consistent alternative for keyboard-reliant users? This page was last edited on 19 November 2018, at 22:12.